Ocean Beach, also known as O.B. is a thriving beachfront neighborhood in San Diego, California. The beach itself was known as Mussel Beach in the beginning due to the mussels that lived there. The neighborhood had its start, as a resort community in 1887 at a mussel roast on the beach where developers Billy Carlson and Frank Higgins began to sell lots to potential residents. The community faltered and nearly failed in the 1890s, but developer David Collier had the faith and vision to sustain it. He promoted the area when no one else would and with the addition of paved streets, electricity and a streetcar line the neighborhood flourished. In the 1960s the area attracted many "hippies" that were drawn to the beach lifestyle and stayed to settle down and open businesses. 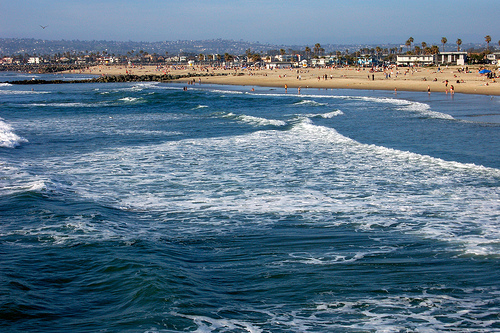 Today the neighborhood is known for Dog Beach and the fishing pier as well as a variety of antique stores and boutiques that provide a unique shopping experiences for visitors and residents alike. Residents of the neighborhood call themselves Obceans and the neighborhood has been home to many notable Obceans like the reggae band Tribal Seeds, MLB pitcher David Wells, the rock band Slightly Stoopid and the author of may "for dummies" books Andy Rathebone. The neighborhood has sub-tropical climate and his home to feral parrots which are locally referred to as "O.B. air force." The neighborhood is home to The Strand, a historic single screen movie house which they are working to preserve. The community also features the Ocean Beach Recreation Center, a skate park, a vegetarian food co-op and a number of small parks. Tourism and small, independent retail businesses are the anchor of the local economy and the community hosts several annual events like the Ocean Beach Street Fair and Chili Cook-off, the Ocean Beach Christmas Parade and the Ocean Beach Kite Festival. The many community events foster feelings of closeness and community pride that make Ocean Beach a rare California gem. The beach, plentiful parks and wonderful climate encourages residents and visitors alike to embrace an active outdoor lifestyle. The many community events foster feelings of closeness and community pride that make Ocean Beach a rare California gem. Homes for sale in the neighborhood span from small starter homes up to beach houses and the like. Other real estate options include houses, apartments and multi-family structures like duplexes for rent as well as upscale apartments and condominiums for sale or lease. Local real estate agents are best equipped to help you find the home of your dreams in bustling, beautiful Ocean Beach, California. Learn more about schools near Ocean Beach complete with ratings and contact information.